It says something about Michael Moore that when he answered his cell phone to talk with the Council, we heard children’s voices in the background. He and younger daughter Marion, age 4, had just eaten lunch together and he was taking her back to her Head Start classroom. Now nearly every child in the room was either calling goodbye to him or asking him to stay. When this busy landscape gardener was young his parents separated and he had few opportunities to spend time with his father. When his own children were born, he resolved to be as active as possible in their lives. He gamely joins 7-year-old daughter Jurnee and little Marion in their play and advises and acts as a positive role model to his son Michael Jr., 15. For years he has also energetically supported his daughters’ education by taking part in Cleveland Head Start, first as a member of the Father’s Conference and then as secretary and now chairman of the Policy Council. “Head Start is a wonderful program,” he enthuses. “Every child should go through it. I just wish more parents would get involved hands-on. 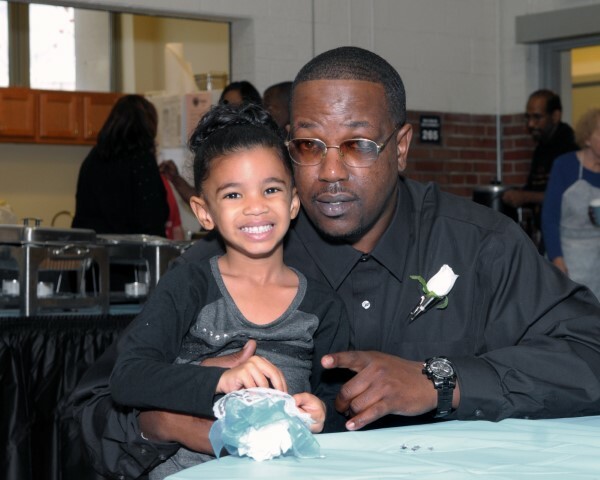 Fathers especially.” His hope is that his demonstrated passion for improving early education will encourage other Cleveland men to step up on behalf of their own sons and daughters. In his introductory speech as chair, Michael told an audience of fellow volunteers and teachers that he thinks of the program’s name as standing for “Helping Everyone Achieve Daily Strategies for Teaching and Reaching Talents.” He credits it with giving his younger children the social and academic boost they need to thrive in school. Marion, he reports, is “completely goal-oriented—she wants to have her own homework, she’s counting, doing math on the computer. She learned to write her name when she was three.” Thanks to similar preparation at the same age, Jurnee was admitted to kindergarten a year early and now happily teaches her little sister the more advanced work she’s learning in second grade.